How to Cite This Chapter: Brimble KS, Guyatt G, Januszewicz A, Prejbisz A. Essential Hypertension. McMaster Textbook of Internal Medicine. Kraków: Medycyna Praktyczna. https://empendium.com/mcmtextbook/chapter/B31.II.2.20.1 Accessed April 20, 2019. Essential (or primary) hypertension is caused by a variety of genetic and environmental factors that interfere with the functioning of one or more of the systems involved in the regulation of blood pressure (BP) and thus lead to increased BP. The following factors play an important role in the development of hypertension: the renin-angiotensin-aldosterone (RAA) system, sympathetic nervous system, natriuretic peptides, and substances produced by the vascular endothelium (prostacyclin, nitric oxide, endothelins). Family history increases one’s risk of developing essential hypertension; it is likely that genetic contributions to hypertension risk are mediated through many or all the factors enumerated above. The lifetime risk of developing hypertension approaches 80% in those aged 80 years or older.Evidence 1High Quality of Evidence (high confidence that we know true effects of the intervention). Robitaille C, Dai S, Waters C, et al. Diagnosed hypertension in Canada: incidence, prevalence and associated mortality. CMAJ. 2012 Jan 10;184(1):E49-56. doi: 10.1503/cmaj.101863. Epub 2011 Nov 21. PubMed PMID: 22105752; PubMed Central PMCID: PMC3255225. Dannenberg AL, Garrison RJ, Kannel WB. Incidence of hypertension in the Framingham Study. Am J Public Health. 1988 Jun;78(6):676-9. PubMed PMID: 3259405; PubMed Central PMCID: PMC1350281. The risk and/or severity of hypertension are increased by excessive sodium intake, physical inactivity, obesity (especially abdominal), and stress (increased sympathetic activation). Clinical classification (grading) based on BP values: Table 1 in Hypertension. 1) Coronary artery disease, including myocardial infarction and angina. 2) Stroke (ischemic and hemorrhagic). 5) Premature death from cardiovascular causes. 6) Renal dysfunction (a urinary albumin-to-creatinine ratio [ACR] elevated ≥3 mg/mmol [30 mg/g]; kidney injury with a decline in the estimated glomerular filtration rate [eGFR] usually developing slowly; in mild to moderate hypertension, the development of end-stage renal disease is rare and usually appears after many years of hypertension). 1) Confirmation of the diagnosis of hypertension. 2) If appropriate, search for causes of secondary hypertension. 3) Assessment of cardiovascular risk factors, target organ complications, and comorbidities. 1. BP measurements: To determine the BP, perform traditional measurements (office measurements using either the manual auscultatory method or automated oscillometric blood pressure; the latter allows a sufficient rest period with the health-care provider out of the room, is typically 5-10 mm Hg [or more] lower, and is preferred), and make use of the self-measurements performed by the patient (see below) as well as—in some cases—also of the results of ambulatory BP monitoring (ABPM). 1) Serum levels of sodium, potassium, glucose (fasting) and/or serum glycated hemoglobin (HbA1c), creatinine (with calculation of the eGFR using the CKD-EPI formula; see Chronic Kidney Disease), uric acid, total cholesterol, high-density (HDL-C) and low-density (LDL-C) lipoprotein cholesterols, and triglycerides. 2) Urinalysis: Urine dipstick test for blood and protein +/– the urinary ACR. 3. A 12-lead electrocardiography (ECG) is suggested in all patients (see Standard Electrocardiogram). 1) Quantitative assessment of urinary albumin and urine microscopy (in patients with positive results of the dipstick test). 2) Measurements of daily urinary sodium excretion to evaluate sodium intake. 3) ABPM and/or home BP measurements. 4) Echocardiography with the assessment of LV hypertrophy and cardiovascular risk in patients where it is unclear if pharmacologic therapy should be initiated or in those with suspected LV dysfunction. 5) Screening for obstructive sleep apnea if clinically suspected (consider using the Epworth Sleepiness Scale [see Obstructive Sleep Apnea] or the STOP-Bang questionnaire [stopbang.ca]). 5. Studies recommended in specialized care: Other studies based on the suspected etiology of secondary hypertension (Table 1). 1) As part of the diagnostic workup. 2) When starting or intensifying antihypertensive treatment. 3) As part of long-term monitoring of patients. The diagnosis is made on the basis of BP values obtained from ≥2 measurements performed on ≥2 visits. Essential hypertension (common) is considered probable if the history and/or initial testing do not suggest underlying secondary hypertension (rare). Clinical guide for exclusion: Table 1. Perform screening BP measurement in all adults periodically (frequency is based on underlying risk factors, including age and previous BP patterns). 1. Secondary hypertension: Clinical indications and diagnostics of secondary hypertension: Table 1. 2. White coat hypertension: An increase in BP in some patients during measurement performed by a physician or nurse; in such patients use ABPM. If the office BP levels are consistent with hypertension while the results of repeated home measurements or ABPM are normal, the diagnosis of white coat hypertension is made. 3. Masked hypertension: Conversely, if the patient has normal office BP levels and elevated results of home and ABPM measurements, the diagnosis of masked hypertension is established. This may be due to smoking, exercise-induced hypertension, anxiety, job stress, or other factors and is not only difficult to detect but also associated with an increased cardiovascular risk. 4. Pseudohypertension: In the elderly the results of BP measurements using auscultation may be significantly elevated due to increased arterial stiffness (sclerosis), which causes the early appearance and disappearance of pulse. This may be observed if the pulse remains palpable even after filling the cuff above the systolic blood pressure (SBP) level (the stiffened artery cannot be sufficiently compressed by the cuff). Another feature suggestive of pseudohypertension is the absence of target organ damage caused by hypertension. In patients with suspected pseudohypertension, measure the BP using oscillometric devices and not auscultation. The management procedure is determined by the BP values, type of target organ complications, patient’s age, and comorbidities (Table 2). In emergencies, such as pulmonary edema, hypertensive encephalopathy, or aortic dissection, immediately lower the BP using parenteral antihypertensive drugs (Table 3), preferably in a continuous IV infusion. We suggest that in such cases the mean arterial pressure should be reduced by <25% of BP reduction during the first hours and cautiously thereafter. In the case of acute stroke, BP should be reduced more gradually, if at all. Comprehensive lifestyle optimization strategies have been shown to lower SBP and diastolic blood pressure (DBP) among patients with hypertension by 14.2 mm Hg and 7.4 mm Hg on average, respectively.Evidence 2Moderate Quality of Evidence (moderate confidence that we know true effects of the intervention). Quality of Evidence lowered due to imprecision and lack of a no-intervention group. Appel LJ, Champagne CM, Harsha DW, et al; Writing Group of the PREMIER Collaborative Research Group. Effects of comprehensive lifestyle modification on blood pressure control: main results of the PREMIER clinical trial. JAMA. 2003 Apr 23-30;289(16):2083-93. PubMed PMID: 12709466. The evidence to date indicates that although some patients may not have hypertension as currently defined (ie, BP >140/90 mm Hg), they may nevertheless benefit from BP-lowering therapy, particularly if they have a higher baseline cardiovascular risk. One must therefore consider the current BP (and not just whether the patient has hypertension), the BP target based on the patient’s characteristics as outlined below, past tolerability of treatment, and personal preferences. With increasing evidence that targets vary among different patient groups, the utility of grading hypertension may ultimately be limited to guiding the rapidity at which to initiate pharmacologic therapy, the number of pharmacologic agents that will likely be required, and consideration of secondary causes. We have recommended a target BP in each case as a range of 10 mm Hg and suggested that treatment be initiated when the measured BP is persistently at or above the upper limit of that range. 2) Treatment with antihypertensive drugs (Figure 1). 3) Optimization of other cardiovascular risk factors. 1) In patients with grade 3 hypertension (SBP ≥180 mm Hg and/or DBP ≥110 mm Hg), promptly start pharmacotherapy combined with lifestyle optimization regardless of the cardiovascular risk. 2) In patients with grade 2 hypertension (SBP 160-179 mm Hg and/or DBP 100-109 mm Hg), start treatment simultaneously with lifestyle modifications, especially in those with >2 cardiovascular risk factors or any one of the following: target organ damage, diabetes mellitus, cardiovascular disease, or chronic kidney disease. In patients not fulfilling these criteria it may be acceptable to delay treatment for a few weeks to observe the effects of lifestyle modifications. 3) In patients with grade 1 hypertension (SBP 140-159 mm Hg and/or DBP 90-99 mm Hg), start pharmacotherapy if the response to lifestyle optimization is inadequate. a) In patients without diabetes or prior stroke who are aged >50 years and who have either clinically evident cardiovascular disease, an eGFR <60 mL/min/1.73m2, or a 10-year risk score >15%, the target SBP is 120 to 130 mm Hg as measured using an automated oscillometric device (125-130 mm Hg using different methods).Evidence 3Weak recommendation (benefits likely outweigh downsides, but the balance is close or uncertain; an alternative course of action may be better for some patients). Moderate Quality of Evidence (moderate confidence that we know true effects of the intervention). Quality of Evidence lowered due to some heterogeneity in other populations. SPRINT Research Group, Wright JT Jr, Williamson JD, Whelton PK, et al. A Randomized Trial of Intensive versus Standard Blood-Pressure Control. N Engl J Med. 2015 Nov 26;373(22):2103-16. doi: 10.1056/NEJMoa1511939. Epub 2015 Nov 9. Erratum in: N Engl J Med. 2017 Dec 21;377(25):2506. PubMed PMID: 26551272; PubMed Central PMCID: PMC4689591. Lonn EM, Bosch J, López-Jaramillo P, et al; HOPE-3 Investigators. Blood-Pressure Lowering in Intermediate-Risk Persons without Cardiovascular Disease. N Engl J Med. 2016 May 26;374(21):2009-20. doi: 10.1056/NEJMoa1600175. Epub 2016 Apr 2. PubMed PMID: 27041480. Yusuf S, Bosch J, Dagenais G, et al; HOPE-3 Investigators. Cholesterol Lowering in Intermediate-Risk Persons without Cardiovascular Disease. N Engl J Med. 2016 May 26;374(21):2021-31. doi: 10.1056/NEJMoa1600176. Epub 2016 Apr 2. PubMed PMID: 27040132. Yusuf S, Lonn E, Pais P, et al; HOPE-3 Investigators. Blood-Pressure and Cholesterol Lowering in Persons without Cardiovascular Disease. N Engl J Med. 2016 May 26;374(21):2032-43. doi: 10.1056/NEJMoa1600177. Epub 2016 Apr 2. PubMed PMID: 27039945. ACCORD Study Group, Cushman WC, Evans GW, Byington RP, et al. Effects of intensive blood-pressure control in type 2 diabetes mellitus. N Engl J Med. 2010 Apr 29;362(17):1575-85. doi: 10.1056/NEJMoa1001286. Epub 2010 Mar 14. 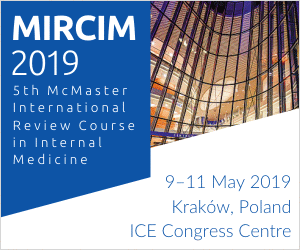 PubMed PMID: 20228401; PubMed Central PMCID: PMC4123215. Brunström M, Carlberg B. Effect of antihypertensive treatment at different blood pressure levels in patients with diabetes mellitus: systematic review and meta-analyses. BMJ. 2016 Feb 24;352:i717. doi: 10.1136/bmj.i717. Review. PubMed PMID: 26920333; PubMed Central PMCID: PMC4770818. Examples of risk calculators: Framingham Coronary Heart Disease Risk Score at mdcalc.com; ACC/AHA 2013 Cardiovascular Risk Assessment at medscape.com. b) In frail, elderly patients aged <80 years and in all patients aged ≥80 years, lower the SBP first to 140 to 150 mm Hg, although further lowering may be beneficial (see Special Considerations, below). c) In patients with diabetes, please see Special Considerations, below. 2) DBP <90 mm Hg in all patients. 1. Reduction of weight in overweight patients and maintenance of a normal body weight (waist circumference ≤88 cm in women, ≤102 cm in men; body mass index, <25 kg/m2). 2. A diet that emphasizes fruits and vegetables, low-fat dairy products, whole grains, and protein from plant sources that is reduced in saturated fat and cholesterol, including nuts, seeds, and legumes (the DASH [Dietary Approaches to Stop Hypertension] diet). 3. Reduction of sodium intake to ≤5 to 6 g of salt. 4. Limitation of daily alcohol consumption to a maximum of 20 to 30 g of ethanol in men and 10 to 20 g in women and individuals with a low body weight. 5. Appropriate physical activity: Regular aerobic exercise, such as brisk walking for 30 to 45 minutes daily. 1. The major classes of antihypertensive agents are diuretics (mainly thiazide and thiazide-like diuretics), beta-blockers, calcium channel blockers, angiotensin-converting enzyme inhibitors (ACEIs), and angiotensin receptor blockers (ARBs). Their BP-lowering efficacy is similar. Beta-blockers have been shown to be inferior to the other agents in their efficacy to reduce cardiovascular eventsEvidence 4High Quality of Evidence (high confidence that we know true effects of the intervention). Ettehad D, Emdin CA, Kiran A, et al. Blood pressure lowering for prevention of cardiovascular disease and death: a systematic review and meta-analysis. Lancet. 2016 Mar 5;387(10022):957-967. doi: 10.1016/S0140-6736(15)01225-8. Epub 2015 Dec 24. Review. PubMed PMID: 26724178. and are generally not recommended as first-line therapy in North American guidelines anymore. Specific indications and contraindications: Table 4. Agents and dosage: Table 5. 2. Additional antihypertensive drugs: Renin inhibitors (aliskiren), alpha1-blockers (doxazosin, terazosin, prazosin), centrally-acting sympathetic inhibitors (methyldopa, clonidine), direct vasodilators (hydralazine, minoxidil), nonthiazide or thiazide-like diuretics. These agents are used in combination treatment and in special situations. Agents, dosage, specific indications and contraindications: Table 6. 3. 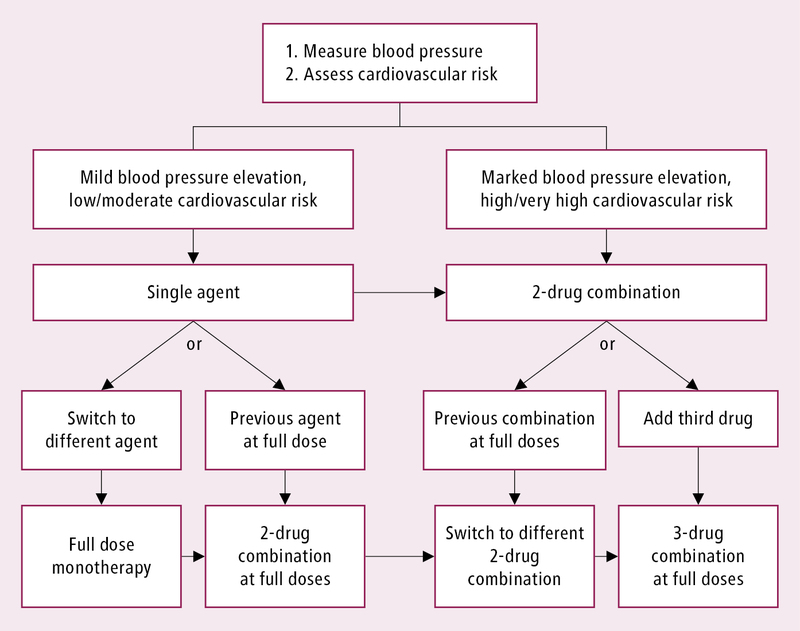 Principles of pharmacotherapy: Depending on the cardiovascular risk as well as the baseline and target BP levels, start with 1 drug at a low dose (any agent of the main antihypertensive classes may be used, unless specific indications for or contraindications to any particular class exist), or 2 drugs at low doses (in patients with BP elevated by >20/10 mm Hg [ie, grade 2 or 3 hypertension] or at high cardiovascular risk). Most agents produce the full antihypertensive effect after a few weeks of treatment, so their effectiveness should be assessed after 2 to 4 weeks. 1) Add a second drug (the preferred strategy). 2) Change to another drug (only if no hypotensive effects have been achieved or if adverse reactions occurred). 3) Increase the dose of the currently used drug (this increases the risk of adverse effects). 2) Add a third drug at a low dose. 1) A thiazide/thiazide-like diuretic + an ACEI. 2) A thiazide/thiazide-like diuretic + an ARB. 3) A thiazide/thiazide-like diuretic + a calcium channel blocker. 4) A calcium channel blocker + an ACEI. 5) A calcium channel blocker + an ARB. The most rational triple-drug combination includes a drug acting on the RAA system (an ACEI or an ARB) + a calcium channel blocker + a thiazide/thiazide-like diuretic. The frequency of follow-up visits depends on the overall cardiovascular risk, BP level, and patient’s compliance (eg, regarding BP self-measurements at home). Once the target BP has been achieved and other risk factors have been adequately controlled, the frequency of visits can be significantly reduced. It may be of value to ask patients to record their resting BP, when possible, on several occasions prior to their follow-up visit. 1) After 2 to 4 weeks of starting antihypertensive treatment. 2) After 4 weeks of introducing a change in the treatment regimen. 3) Every 3 months after achieving the target BP. 1. In elderly patients (>65 years of age) the most common form of hypertension is isolated systolic hypertension. Moreover, orthostatic hypotension frequently occurs (BP must be measured in an upright position, drugs increasing the risk of hypotension must be avoided), and BP values are highly variable. 2. In patients aged >80 years antihypertensive treatment reduces cardiovascular morbidity and mortality. 3. Start antihypertensive treatment in patients with an SBP ≥160 mm Hg. In those aged <80 years, starting the treatment may also be considered when the SBP is 140 to 159 mm Hg as long as the patient tolerates the treatment well. 4. The original target SBP is 140 to 150 mm Hg. Caution is advised in patients with a DBP <60 mm Hg due to the risk of unacceptably low myocardial perfusion pressure. Recent data suggest that even in the elderly population with clinically evident cardiovascular disease, an eGFR <60 mL/min/1.73m2, or a 10-year risk score >15%, gradual lowering of SBP to as low as 120 mm Hg (using AOBP with a period of rest; targets for BP measured in a different way may be higher), if tolerated, may be beneficial in comparison to the target value of 140 mm Hg.Evidence 5Moderate Quality of Evidence (moderate confidence that we know true effects of the intervention). Quality of Evidence lowered due to concerns about generalizability of the population target to the individual patient. Williamson JD, Supiano MA, Applegate WB, et al; SPRINT Research Group. Intensive vs Standard Blood Pressure Control and Cardiovascular Disease Outcomes in Adults Aged ≥75 Years: A Randomized Clinical Trial. JAMA. 2016 Jun 28;315(24):2673-82. doi: 10.1001/jama.2016.7050. PubMed PMID: 27195814; PubMed Central PMCID: PMC4988796. 5. In patients approaching 80 years of age with a good tolerance of antihypertensive treatment, consider continuation of the treatment. 2) Start treatment with low doses of drugs. 3) Note that interactions with other drugs may occur. 4) Choose simple treatment regimens. 7. You can start treatment with a drug from any major antihypertensive class; however, in patients with isolated systolic hypertension start with a diuretic (thiazide or thiazide-like) or a calcium channel blocker. As comorbidities are frequent in patients with hypertension, these should be taken into consideration when choosing antihypertensive agents. 8. In a significant proportion of patients, it is necessary to use ≥2 antihypertensive drugs to achieve the target BP levels. 1. There is currently some uncertainty as to the BP target, as demonstrated by differences in the most key clinical practice guidelines. SBP targets range between 130 to 140 mm Hg and DBP between 80 to 90 mm Hg. We suggest a BP target <130/80 mm Hg in those with diabetic nephropathy if it can be achieved without undue treatment burden. Otherwise a target <140/90 mm Hg is suggested (see Diabetes Mellitus). Lowering SBP <130 mm Hg is likely not beneficial. 2. All the major classes of antihypertensive drugs have beneficial effects in this group of patients. 3. ACEIs and ARBs have renal protective effects, significantly reduce proteinuria, and are the preferred option in patients with albuminuria. 4. In the majority of patients, the target BP values can only be achieved with ≥3 appropriately selected antihypertensive drugs. 5. BP should be measured in an upright position due to the increased risk of orthostatic hypotension. 6. Intensive lifestyle modifications are of particular importance (see Lifestyle Modifications, above). In patients with no additional cardiovascular risk factors, consider limiting the intervention to lifestyle changes, as long as careful follow-up is continued. In patients with a higher cardiovascular risk due to metabolic disturbances or asymptomatic target organ damage, you may consider adding antihypertensive pharmacotherapy. Consider introducing both lifestyle changes and antihypertensive drugs, as this category of hypertension is associated with a cardiovascular risk similar to that of hypertension observed in both office and home measurements. Hypertension is defined as resistant if target BP values cannot be achieved despite the use of ≥3 antihypertensive drugs (including a diuretic) at optimal doses and in appropriate combinations. 1) Noncompliance with the antihypertensive drug regimen and with lifestyle modifications (alcohol abuse, tobacco smoking, excessive sodium intake, persistent obesity). 2) Inappropriate drug combinations (failure to include a diuretic in treatment, using a diuretic at inadequate doses, or failure to adapt the type of the diuretic to the patient’s renal function). 3) Pseudoresistance to treatment (BP measurement errors, white coat hypertension [see above]). 4) Pseudohypertension (see Differential Diagnosis, above). 6) Drug interactions reducing the efficacy of antihypertensive drugs (nonsteroidal anti-inflammatory drugs [NSAIDs]). 7) Treatment with drugs that increase BP. 8) Metabolic syndrome (insulin resistance). 1) Resistance to treatment is confirmed in patients in whom target office BP levels are not achieved despite treatment with ≥3 antihypertensive drugs at optimal doses, including a diuretic. 2) Exclude pseudoresistance: Determine whether the patient is compliant with the recommended treatment and exclude white coat hypertension (if the patient has abnormal office BP levels with normal BP levels in self-measurement or ABPM, pseudoresistance to treatment is confirmed). 3) Identify and attempt to modify adverse lifestyle factors, such as obesity, excessive alcohol consumption, or high sodium intake. 4) Eliminate or minimize the effect of substances that increase blood pressure, such as NSAIDs, sympathomimetic agents (appetite suppressants, decongestants), stimulants, and oral contraceptives. 5) Search for causes of secondary hypertension. 6) Modify pharmacotherapy: Maximize diuretic treatment (consider adding an aldosterone antagonist or amiloride, use loop diuretics in patients with renal failure), use drugs with different mechanisms of action. 7) Refer the patient to a specialist in the case of a confirmed or suspected secondary hypertension, or if hypertension remains uncontrolled despite a sufficient duration of treatment. The most severe form of hypertension, characterized by a DBP >120 to 140 mm Hg, rapid progression of target organ complications, and particularly by the development of heart failure, renal failure, and severe lesions in the retinal vessels (transudates, ecchymoses, papilledema). Malignant hypertension may develop in the course of hypertension of various etiologies, both essential and secondary, and is most common in patients with renal artery stenosis or glomerulonephritis. The term “malignant hypertension” was used in the past to indicate the very poor prognosis in such patients. Symptoms are often present and can include weakness, headache, dizziness, dyspnea, chest pain, and less commonly abdominal pain (caused by abnormalities of intestinal vessels). Symptoms of rapidly progressive renal failure as well as central nervous system symptoms of varying severity, up to severe encephalopathy, may predominate. The patients are at increased risk of stroke and heart failure, often in the form of pulmonary edema. Diagnosis is based on the clinical and laboratory manifestations. Adapted from: Mancia G, Fagard R, Narkiewicz K, et al. 2013 ESH/ESC guidelines for the management of arterial hypertension: the Task Force for the Management of Arterial Hypertension of the European Society of Hypertension (ESH) and of the European Society of Cardiology (ESC). Eur Heart J. 2013 Jul;34(28):2159-219. doi: 10.1093/eurheartj/eht151. CT, computed tomography; CV, cerebrovascular; eGFR, estimated glomerular filtration rate; HTN, hypertension; MRA, magnetic resonance angiography; MRI, magnetic resonance imaging; PKD, polycystic kidney disease; RAAS, renin-angiotensin-aldosterone system; RBC, red blood cell; US, ultrasound. a Although in the acute phase of stroke a major increase in BP may occur, do not lower BP rapidly, as this may result in a reduction in cerebral blood flow and subsequent expansion of ischemia. BP control in patients with stroke: see Stroke. Lowering of BP in acute aortic dissection: see Aortic Dissection. BP, blood pressure; DBP, diastolic blood pressure; ICU, intensive care unit; IV, intravenous. a Each of these drugs may cause hypotension. Based on: James PA, Oparil S, Carter BL, et al. 2014 evidence-based guideline for the management of high blood pressure in adults: report from the panel members appointed to the Eighth Joint National Committee (JNC 8). JAMA. 2014 Feb 5;311(5):507-20. doi: 10.1001/jama.2013.284427. ACEI, angiotensin-converting enzyme inhibitor; AF, atrial fibrillation; ARB, angiotensin receptor blocker; AV, atrioventricular; COPD, chronic obstructive pulmonary disease; DM, diabetes mellitus; HF, heart failure; IGT, impaired glucose tolerance; LV, left ventricle; MI, myocardial infarction. a Not available in Canada. bid, 2 times a day; INN, International Nonproprietary Name; qid, 4 times a day; tid, 3 times a day. ARB, angiotensin receptor blocker; bid, 2 times a day; tid, 3 times a day. Figure 1. Decision algorithm for monotherapy vs combination treatment strategies in hypertension. Treatment should be intensified whenever target BP values are not achieved. Adapted from the 2013 European Society of Hypertension and the European Society of Cardiology guidelines (see Additional Information for details).